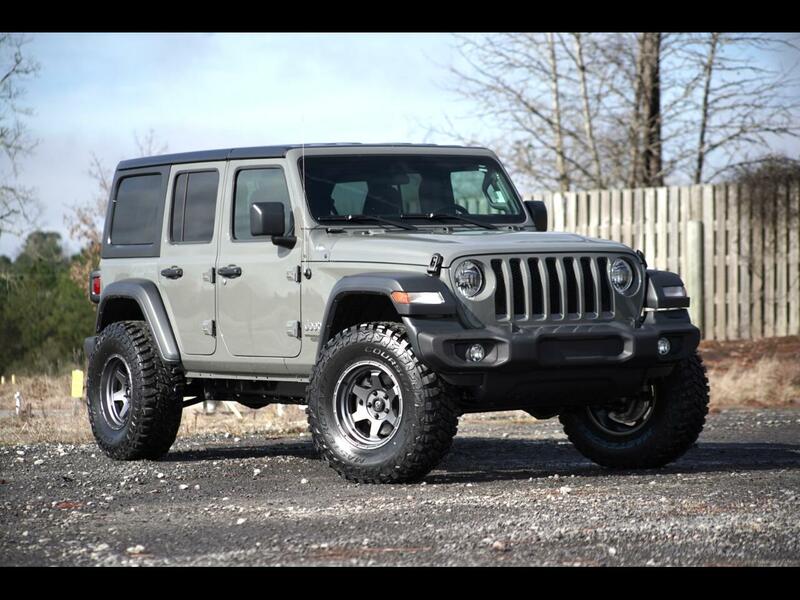 BRAND NEW 2018 Jeep Wrangler JL Unlimited Sport, V6, 3.6L, AUTO, Sting Ray Grey, Hard Top Convertible with ONLY 263 MILES!!!! Our service team just finished installing a Rough Country Lift, Fuel Off road Wheels and NEW Mastercraft Courser MXT tires, with a fresh inspection and full service! Inside you will find black cloth seats, factory touch screen interface, AM/FM SAT radio, Bluetooth, Hill assist, Push button start, Plug in Media outlet with AUX and USB ports, Steering wheel controls, cruise control, auto headlights, fog lights, backup camera, power windows, power door locks, power mirrors and MORE! If you are interested in this lifted Jeep wrangler or any of our available inventory, please give us a call, 803-808-5235 OR STOP by and take a test drive TODAY! !